You can download all the separate Body Beast workout sheets, the Body Beast Lean Beast and Huge Beast schedules, calendar and improved worksheets from this page. “Do you need to go get a note from your mommy?” – one of the many great one-liners that Sagi comes up with during the course of Body Beast. I’ve just started my Body Beast journey after successfully completing Insanity training a few weeks ago. I’m also covering my Body Beast workout progress, so you know what to watch for and can find out how it all went for me. I wanted to be able to download and print out all the Body Beast workout sheets separately, fill them in and add them to my workout records. 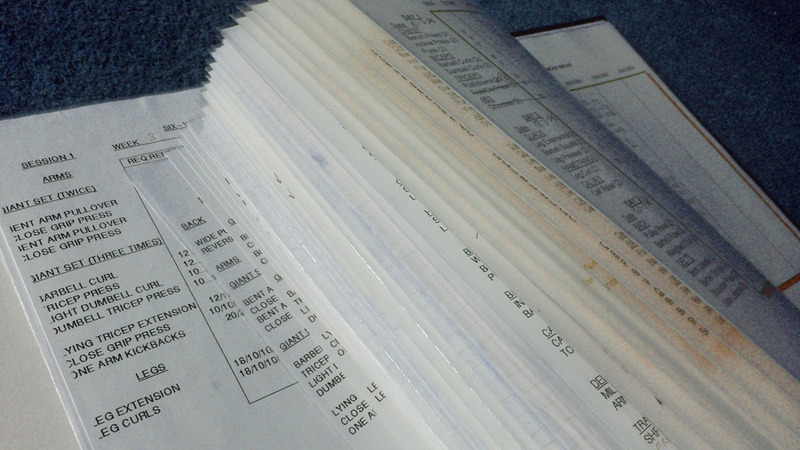 I have a folder going back to the 1990s with all my old gym workout sessions in it, so I always want to have the same kind of Excel spreadsheet look that the rest of my stuff has. As a result, I’ve started to put together single sheets of all the Body Beast exercise sessions and figured I’d share them with you so you can download them. 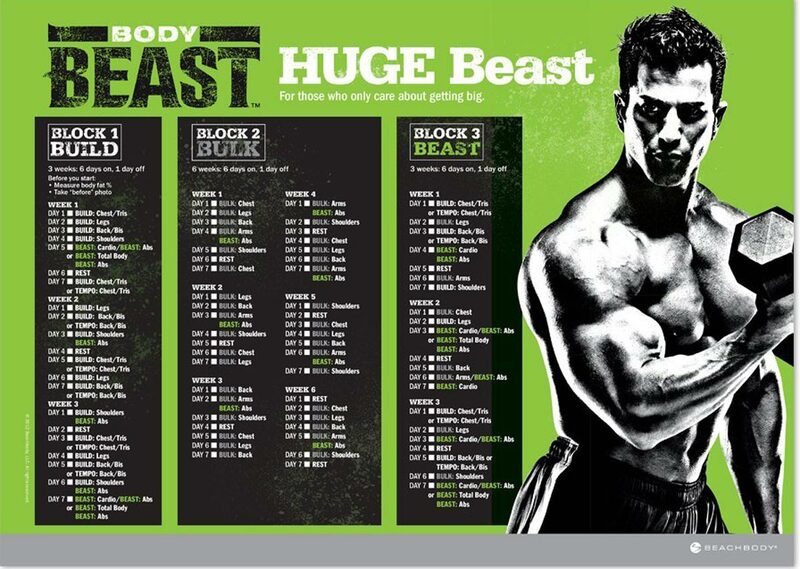 As well as the Body Beast workout routine PDF files, you can also download the Body Beast Huge schedule and Body Beast Lean schedule calendars. 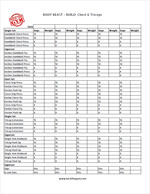 I hope you find these Body Beast workout sheets useful, I’ve tried to improve them so that they are easy to fill in and refer back to, allowing you to track your improvements. And here’s a body measurements chart that I put together so you can track your progress. Good luck on your journey! I hope these charts are useful to you. If so, please spread the word or leave a comment – it’s very much appreciated! And if you spot any changes that are needed, just let me know. I’ll continue to add more Body beast chart downloads to this page until it’s all up to date. What’s your favourite Body Beast workout session? Meanwhile, here are some links to other aspects of the Body Beast workout programme and how to get the most gains. Take a look! p.s. I personally prefer doing 16,12,8 reps instead of 15,12,8. Make it more challenging for myself. That way each set is broken down into four separate parts. “Hope sagi wouldn’t be offended in any way”. 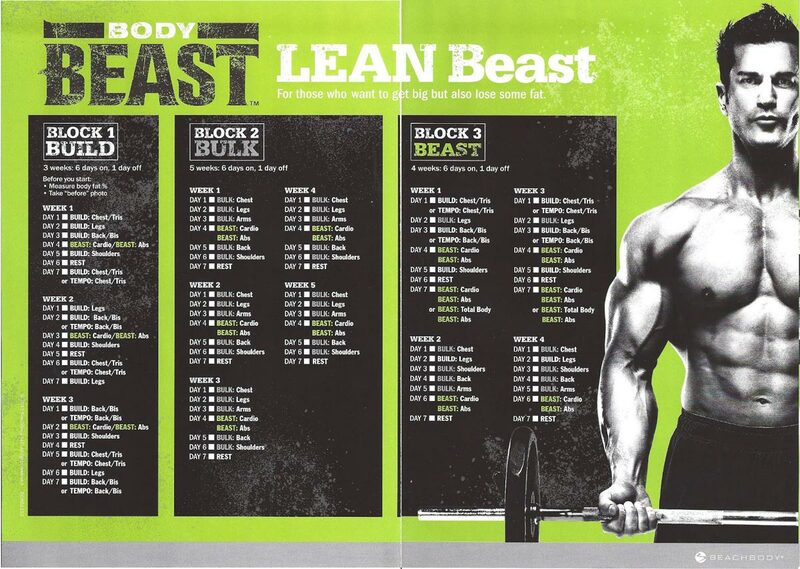 Do you have the Download sheets for the Body Beast Bulk workouts? I see on here there is only the Build versions. i really like the format you have them in and was hoping you had the Bulk ones in the same format? thank you! Thanks for the message, great that you like the format! If you give me till late next week I’ll have them all sorted for you. Thanks Andy for putting up the workout sheets.. Also like the format and hope that you can get the Bulk sheets up soon! Thanks! I’m glad these sheets are of use. I’m taking a look today, so visit again soon and some of them will be on here. Thanks Brian, you’re right. I’ll get bulk shoulders uploaded soon. Sure, I’ll take a look over the next couple of days. How do you go about downloading these sheets? I tapped everything but nothing happened. I have the program but want to send the sheets to a friend. Hi there, Kelly, sorry for the delay in getting back. If you tap on the image of each sheet that should be all you need to do. I just tried it to make sure it’s still working and all is good.